Something interesting and provacative has been going on. A camera club colleague, Kathy Lapergola, has been experimenting with overlaying semi-transparent “texture” images, e.g. a whispy curtain, on top of conventional images. This is accomplished using layers in Photoshop. With this process she has achieved some beautiful images which have the appearance of old paintings. Here is an example of her work. Image by Kathleen Lapergola. Used by permission. Well, I decided that I had to try this. 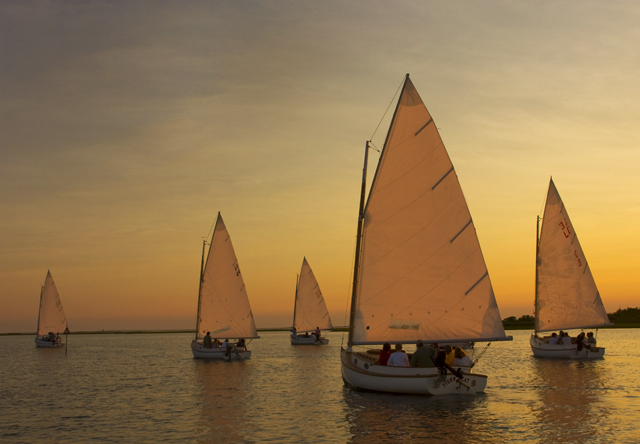 The image below is one that I captured a few years ago during a twilight sailing event. The colors of the sky, the arrrangement of the boats, and the setting sun’s effect on the sails all added up to produce a lovely image. It already had the cast of a Venentian painting but I felt it might be a candidate for texturing. Below is the result. I overlaid an image of a soiled and cracked, age-yellowed muslim. Using another Photoshop tool I then reduced the opaqueness of the muslin image, i.e. the top layer, gradually revealing the bottom layer which gradually becomes colored and shaded and marred by the semi-transparent upper layer. The result is an image that looks even more like an old classical painting. So, a good thing? A bad thing? A pretty thing? Well, consistent with quantum theory I have to say, “It depends.” Certainly the technique can yield some beautiful results. As such, I’d hang them on my wall and would proudly sell them, making it clear that they’re Photographic Compositions and not paintings. Will certain artists and photographers become manic? It’s a given. But, who should care so long as the result is desirable? It’s not the technique that matters; it’s the result!! Should they be entered in juried photography exhibitions? I’d be nervous about that just as I am about entering images that have been altered such that they show things that weren’t “there” at the moment the shutter snapped. But, I do think that as a photographic art form they can legitimately be offered for a juror to evaluate. Should they be entered in “art” exhibitions that don’t preclude photography? I certainly think so. A photographic image, per se, can be art depending on its content, composition, tone, and light. This technique just enhances or adds to the underlying image. This blog includes the opportunity to comment below. I hope that this post elicits other insights. They’re beautiful, both yours and Kathleen’s. You see this technique sometimes on iStock in some of their premium images, so that should tell you something about its added value. (Disclaimer: the ones on iStock typically use a scan of old paper to give an antique appearance, not a painterly appearance.) Also, wasn’t one of the MAC HMs handled this way? The tree image? Yes, I think it was, Terry, and I think there was one other as well. It’s funny because Tracey had said the judge didn’t really care for “altered” images. I will tell you this…. I applaud anyone who puts a textured image in a juried show. From my experience the judges seem to shy away from anything they deem over manipulated. My feeling is they like to keep the essence of a photograph and not a combination of techniques. Maybe they can not see and image for what it evokes. My pet peeve is when judges rave about the technique but the images are dull and out of focus. The above images are far from dull and do evoke a sustained interest. I love the effects that each of you has created in these two images. Some day I will have the time to actually do some experimentation with this technique. Your blog on texturing photos raises a few more questions related to digital photography. I guess what bothers me about the texturing is the question: who or what is the photographer, the user or the computer? I realize that that there is some subjectivity required by the photographer in order to get the texture right, but it’s not the same as creating art. 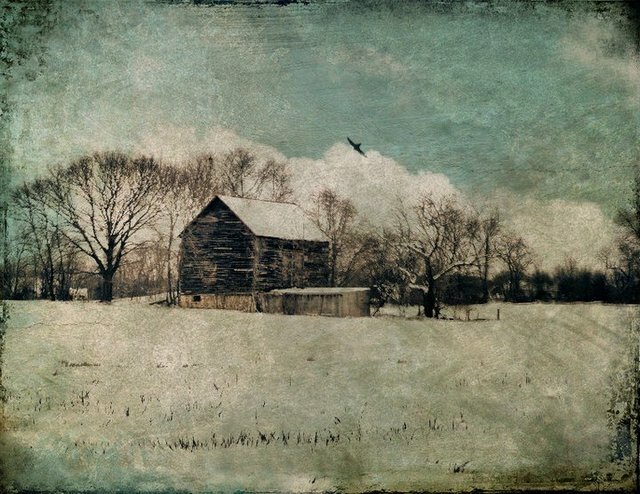 Creating art is a very subjective and personal endeavor, and making a photograph look like an old painting seems to me to be just another quick digital trick. 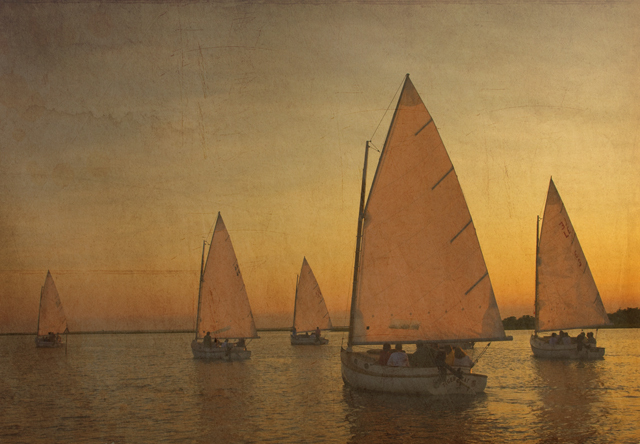 When I look at your photo of the sailboats in the sunset (which I have always admired! ), I am more captivated by the original than the textured. The textured version looks like what it is, something applied over a good photograph to make it look “arty.” Is there a market? Sure, as a commodity it will look great hanging in some dentist’s waiting room. People will buy it, but I don’t think it will ever hang in a museum, or even in a decent gallery. Which raises the question: is texturing really any different than using other computer techniques, such as dodging and burning, exposure adjustments, sharpening, etc? I believe there is an important distinction. Texturing manipulates the entire image to make it look like something it isn’t, while dodging, burning, etc, are used to emphasize certain features of the composition, comparable to what a painter does on his or her canvas. In other words they work with a photograph in a more subjective, rather than in a pastiche, manner, and therefore have a more intrinsic, rather than applied, quality. The digital age has given photographers a whole new array of techniques. How we use these techniques will define what is art and what is an imitation of art. So that’s my two and a half cents worth. Only if I get a finder’s fee. Very nice… I’d like to learn how to do this! « MY LATEST FIELD TRIP ….. PETSMART?